This essay takes several disparate jumps, so those looking for smooth segues between paragraphs will be disappointed. However, it will all come together at the end. One of my side interests, pursued through print media and televised car auctions, is the field of “retro-mod” cars. The general idea here is to take a classic car (however you chose to define that nebulous term) and retain the overall body shape while updating everything underneath. For a long time I lusted after a retro-mod ’67 to ’69 Chevrolet Camaro. With a modern LS3 or other engine, new suspension and much better brakes, a 5 or 6 speed transmission, and modern semi-racing seats, you end up with the performance of a modern Corvette, or much more, and the fantastic looks of the original Camaro. However, there’ve been so many of them in recent years that I’ve become jaded, and my wandering eyes have turned to unusual retro-mods instead. At a recent auction there was a ’54 Nash Rambler station wagon that had been resto-modded with all the bells and whistles. It was a delight, and sold for $29,000, which had to be a pittance compared to the likely build cost. I was attracted to it because my mother drove my two brothers and me from Buffalo, New York to our new home in Minneapolis (Dad had gone ahead). Imagine the courage of a woman driving alone for two days with three boys aged 11, 10, and 6 (me) in 1953! I had my first ride on a motorcycle in 1962, at the age of 15. My older brother’s friend gave me a very intelligent introduction to motorcycles. He explained how they turned and told me what I was to do before we got on. We set off on his Yamaha 250 and went for about a 15 minute ride, and my life was changed forever. Without even holding the controls sitting on the front seat, I knew that riding motorcycles was what I was supposed to do. I announced this startling epiphany to my parents, who were notably unimpressed. In high school, copies of early Cycle World magazines were passed from one goggled-eyed friend to another, treated as if they were precious religious texts. What first grabbed my eager eyes were pictures of café racers from England. Triumphs, Nortons, “Norvins,” and others with lowered handlebars and loud exhausts. The riders wore black leather jackets with long socks peeking out over the top of their tall black boots. Oh my – that was what I wanted! I lacked a few things, like a motorcycle, any experience, any gear, and the permission of my parents, but my enthusiasm burned – for several years. Eventually salvation arrived when I was 20, in the form of a 1965 Yamaha TDS 3. In college I came across a friend’s rental house. Jerry had been my lab partner in high school chemistry, the starting guard on the basketball team that won the state championship (that I was cut from and deservedly so) and had married the best looking cheerleader. There in the driveway sat a brand new yellow and white Bonneville, and I’ve never been so consumed by raw jealousy. Forty years later I learned that the bike had been stolen after two weeks of ownership and never recovered. He had divorced the woman a few years later. Life is odd. I rode the Yamaha every chance I got, including a ride to Seattle and back. Remember Zen and the Art of Motorcycle Maintenance by Robert Pirsig? He did his ride in 1969, and I had taken the very same route to Seattle a year earlier, including the exact same campgrounds. Motorcycles provided the impetus to seek a teaching job far from the snows of Minneapolis. I moved to the Seattle area in the spring of 1969 to begin my teaching career, and threw the Yamaha into a ditch at 60mph three days after I arrived! That was the first and only serious crash I’ve suffered in 50 years and several hundred thousand miles. The separated shoulder healed, and I purchased a 1969 Honda 450 Street Scrambler. That fall the TV show “Then Came Bronson” debuted, and every week all of my serious life choices were confirmed. A lone guy out on the road on his bike. I had done that, despite a lot of people telling me it was nutso, and I would do it again. And again. By 1973 I was married and had a brand new Honda 500 4. Susan purchased a gift for my birthday. The book was titled Café Racers (still have it), and I read it and pored over the pictures repeatedly. Fast forward to today, where retro-mods are the current fashion among motorcycle manufacturers and, to a lesser degree, car manufacturers. Cars are more restricted by ever changing safety and emissions standards, so the current offerings, such as the Camaro, Mustang, and Challenger, pay homage to the originals while not coming all that close to them. Except in performance, where they are vastly superior. As motorcycle sales have plummeted in the past decade (insert your analysis of why here), motorcycle manufacturers have begun to turn to the past to try and mine sales from their heritage. Harley-Davidson has been doing this for decades or course, but Triumph has probably been the most successful in recreating almost exactly “the look” from 50 or 60 years ago. The “new” Triumph Bonneville of 2001 was a good attempt and sold well for years, but an upward kink in the exhaust pipes drove the true believers to distraction. I purchased the re-designed Triumph Bonneville T 120, now with a 1200cc engine, in 2016. It was so similar to the Bonnevilles of the late 1960s that when I first saw one on the dealer floor I was not sure it was not a recent restoration of an original. This thought was shared by my friend standing next to me, who had actually owned a restored 1969 model for years. It was amazing. When I parked it next to a friend’s 1973 a few weeks later we were stunned to see how closely they resembled each other. His was an air-cooled 650cc. The 1200 has water cooled cylinder heads, which means the cooling fins can be made much smaller, so the engine appear to be the same size, even though mine cranks out almost twice the power. 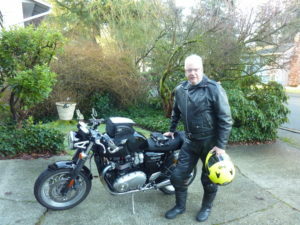 Then, as you read previously, I came into possession of a 2016 Triumph 1200 Thruxton, sold just two months after I purchased mine, from the same dealer. Now I had two Triumphs, and life was excellent. One day I noticed a classic “Marlon Brando” style black leather jacket hanging on the gear rack in the garage. It had been given to me by a friend who had picked it up at a garage sale. He already had an identical jacket, and was unable to find anyone in his vintage motorcycle club who wanted or needed one. His instructions to me were to use my contacts to try and sell it, and then donate the money to Riders for Health. I tried several times without success. On this day I took it down and noticed that if you folded the “bat wings” back it made a perfect 1960’s era café racer jacket. I wore it last weekend for a ride on the Thruxton that turned out to be much colder than anticipated, and it worked a treat. I’d already taken care of donating money to the charity, so I asked my friend if I could repay him for his initial cost. This morning I bought his breakfast, so we’re good! Now I have two motorcycles that are retro-mods. Both have much more power, better brakes, and better handling than their progenitors from the 1960’s, and vastly improved reliability. In addition, I’m sort of a “retro-mod” myself. A scary medical situation due to an infection in my spine (! Source never identified) took 8 weeks of almost equally scary medications to cure – 4 hours a day of mysterious and almost as dangerous antibiotics drained into my arm through a port installed for the purpose. During this trauma I was tested for everything under the sun, and emerged with a clean bill of health. With renewed motivation, the frequency and rigor of gym workouts increased, and I’m now stronger and in better shape than at any point in about 40 years. True, I no longer have the rugged good looks of youth, but I didn’t have them in my youth either. 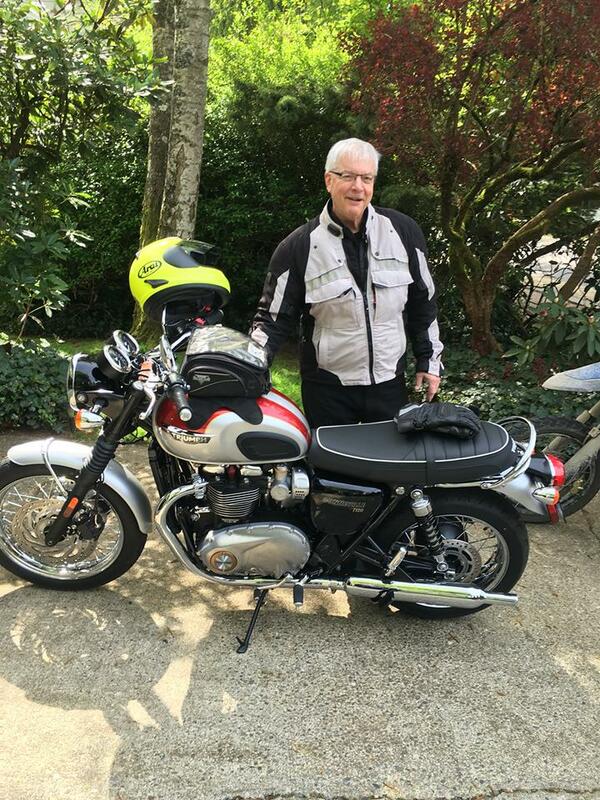 I can now go for a long ride to the past of several days duration on the Bonneville, summoning the mind set of Bronson, or a day ride on the Thruxton – and I am a “rocker” from the 1960’s. Except for the helmet, as I am wedded to the comfort and protection of my modern Arai. I recently learned that Michael Parkes (Bronson) had evidently asked the producers if the character could ride a Triumph Bonneville rather than the Harley Sportster used, and was denied. Perfect! This is actually a lot better than a mental return to a youthful past. It is a functioning return to a youthful past that I yearned for that never existed! This entry was posted in Cars, Equipment, Marketing, Motorcycles. Bookmark the permalink. Sir Preston! We need to get you with your leathers and Thruxton downtown Seattle in Pioneer Square for some photo shoots of you in the brick and cobblestone alleys. I’ll lend you a black helmet to hold while proudly screwing your face into a tormented yet emotionally distant stare ala Brando.